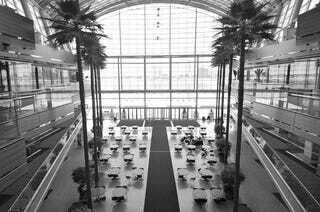 The riverfront side of the GM Renaissance Center holds a five-story-tall atrium known as the Wintergarden. It has palm trees. You can see Canada. Until today, I'd only ever been there in the relative cheer of summer. Snow season? Oy. I lived in the Detroit area for three years before moving west, but I never got used to the winters. Given that I moved to Michigan from Chicago, this is an odd statement to make, but it's true. And while there were a lot of things that I liked about Michigan, the snow hype is spot-on: The Great Lakes State is not an easy place to spend a winter. If you go by the numbers, the D's October-to-April stretch isn't much different from that of Chicago. It's about as wet and gray and roughly as long. Somehow, though, it feels different. It probably has something to do with the urban sprawl and lack of a vibrant downtown, but I never thought about it that much, preferring to look on the bright side. And while my time in Michigan was spent in the small college town of Ann Arbor, where the snow usually takes on a quaint charm, it was still rough. And going downtown was rougher. GM's Renaissance Center sits smack in the middle of Detroit's riverfront. It tends to remind you of a landlocked lighthouse, or maybe those pictures of post-nuclear-bomb Hiroshima, the ones that show vaporized city blocks with a sole concrete structure in the middle of the rubble. A lot of downtown Detroit's amazing prewar architecture still stands, but a great deal of it appears vacant, lending the city a post-Fat-Man feel when seen from the air. When the RenCen was built in 1977, it was labeled a city within a city, a five-building ode to urban renewal. Viewed on its own, it still seems that way, but the city around the city has yet to catch up. If you drive along the riverfront, the Wintergarden is pretty hard to miss. It sits on the RenCen's Canada side, sticking off the front of the building like an ornate glass ornament. I'm staying in the attached Marriott for the weekend, so I took a couple of minutes today to walk around and get a feel for the place. I'm sure there was a point to the thing when it was built, but at the moment, one day after a huge snowstorm and in the middle of a stumbling economy, it just seems to evoke everything sad about Detroit. The windows look out on a depressed Canadian town and what must be one of the world's bleakest rivers. The palm trees have cobwebs in them and are a sighing, resigned shade of green. The tables are free of people; the shopping area on the first tier, which includes a Joseph A. Bank store, is half-empty and peppered with vacant shelving. What does all this mean? Other than "it gives me a bad case of the sads," I'm not really sure. Given enough time, Detroit will rise again, and the RenCen will probably be at the center of that — excuse the pun — renaissance. But for now, the Wintergarden is just one more place in the D that I have no desire to go. I wish, with every bone in my body, that it were different. I want the RenCen to be a shining beacon of everything that's good about American industry, and I want Detroit to be what it once was. It can happen. I know it. And while I don't live in Michigan any more, I'm pretty sure that a lot of people there feel the same way. Godspeed, big D. Get well soon.